This post has been a long time coming. Saber Grills sent us one of their 4-burner Elite grills two years ago. Shortly after it arrived, I hurt my back and the project was postponed. Winter rolled in and the grill, along with cabinets, drawers and doors, sat in our garage for months. Then last summer we had to fix a few things with the foundation of our deck (don’t hire cheap labor for home improvement) and didn’t end up building the grill area until September – just in time for our photo shoot with DIY Magazine (for real, they showed up the same day we installed the countertop and grill). First, disclaimers. And I wish I didn’t have to, but that’s the world we live in and we have to cover our bases. A. I can’t encourage you to build your outdoor area the way we built ours. Every state has their own building codes when it comes to something that could catch your house on fire, so study the recommendations of the grill you buy, the code for your state, and adjust according to your circumstances. 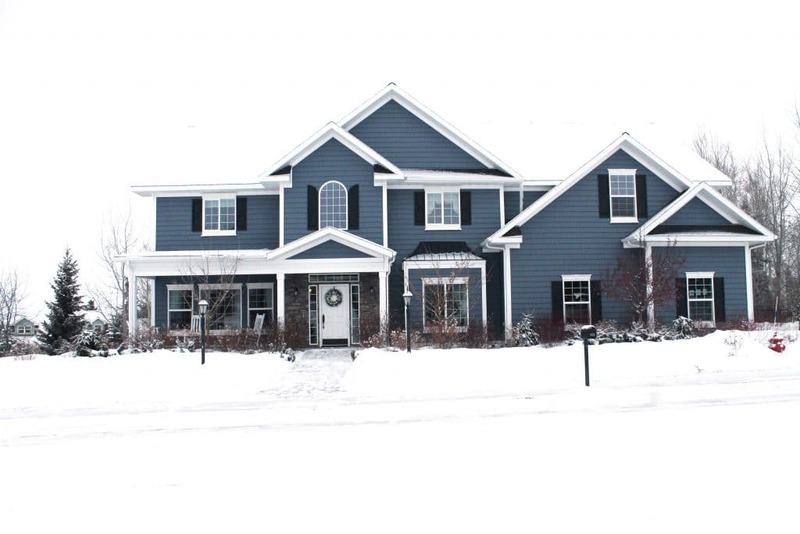 We consulted with a couple builders and took our plan to our local zoning office, but just because we did it like this doesn’t mean you can or should. B. I am not going to share measurements. 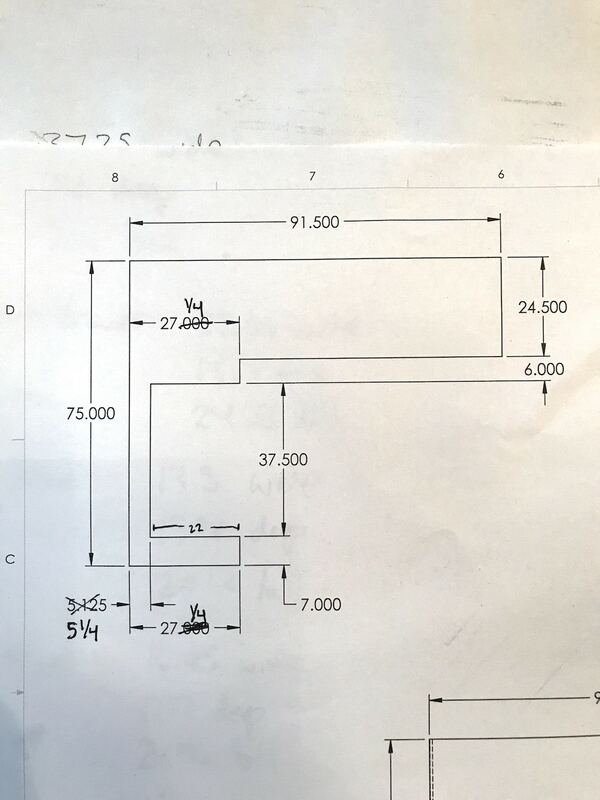 The measurements of our grilling area are completely irrelevant to you, because our space is not the same size as your space. Our grill likely doesn’t have the same dimensions as your grill (unless you buy the one we have). 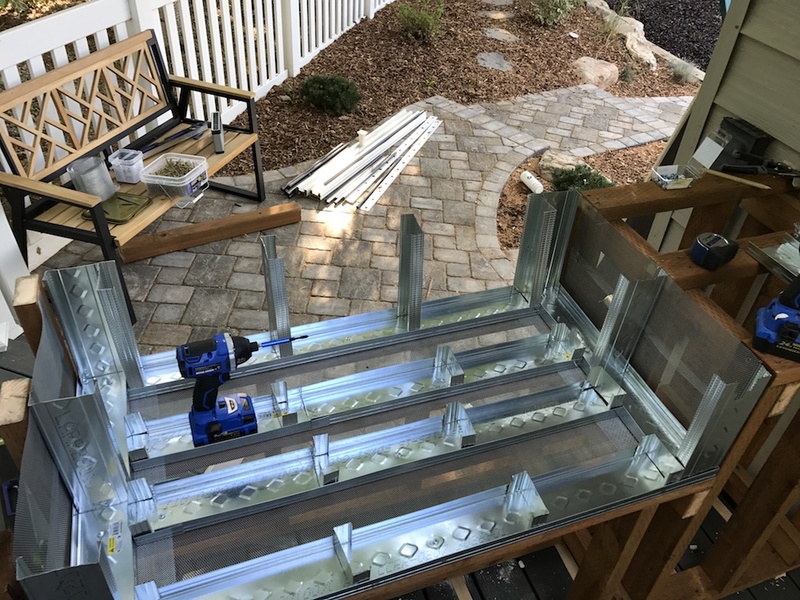 I’m going to share our process so you can know how we did it, and if you choose on your own accord to do something similar (that falls within building code and is safe for your home) then hopefully this will be helpful. C. There is no “C”. But a list with only two items seems underwhelming, so this item has been added for affect. Let’s get started. • thickness of materials like 2x4s (which are not 2inx4in), concrete board, brick or stucco work etc. 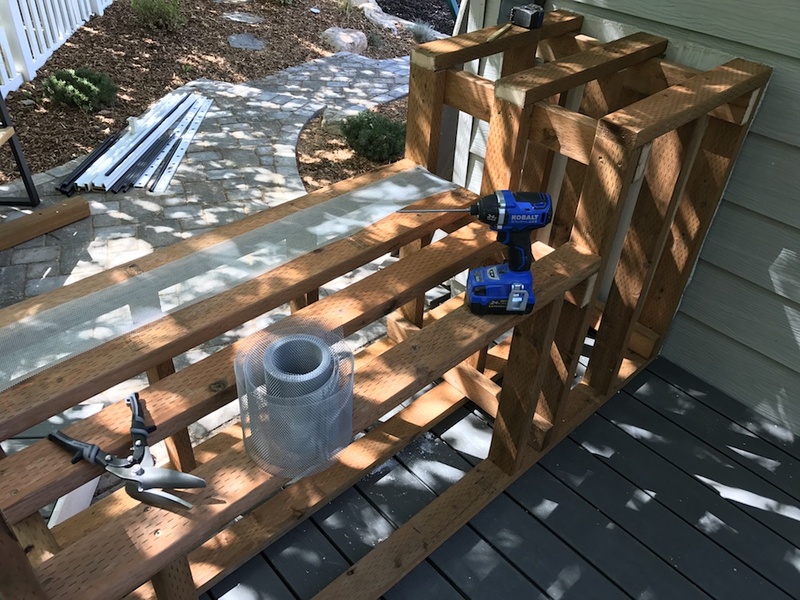 For example, if you want a space to be 39in wide when all is said and done, you need to plan your framing to include a layer of concrete board, so if you’re using 5/8in concrete board, you would widen the entire area by 1 1/4in (5/8 on each side). And you need to plan for that on every dimension. 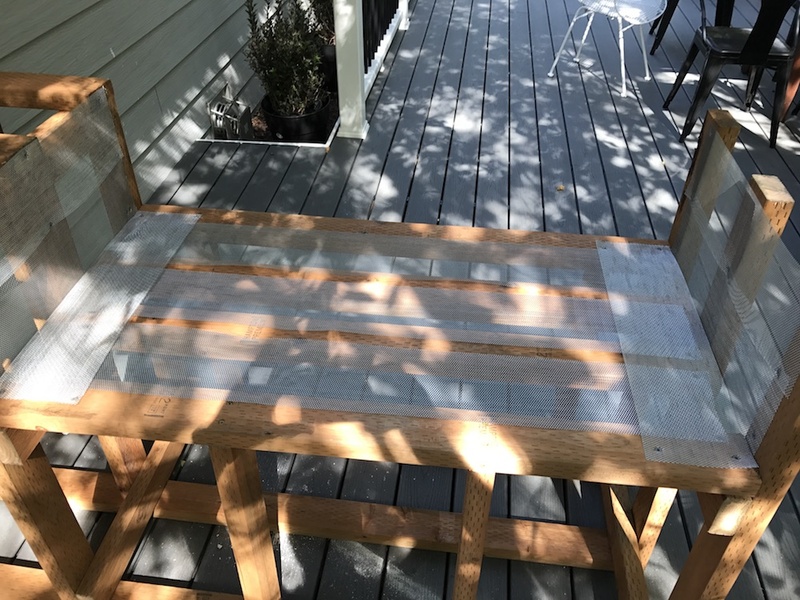 Since the grill is outdoor, we used pressure treated lumber. Not only will it handle the elements better, but it’s also a tad more heat resistant than regular lumber. But don’t lean on that too hard – it will definitely catch fire if you don’t build in a proper barrier. 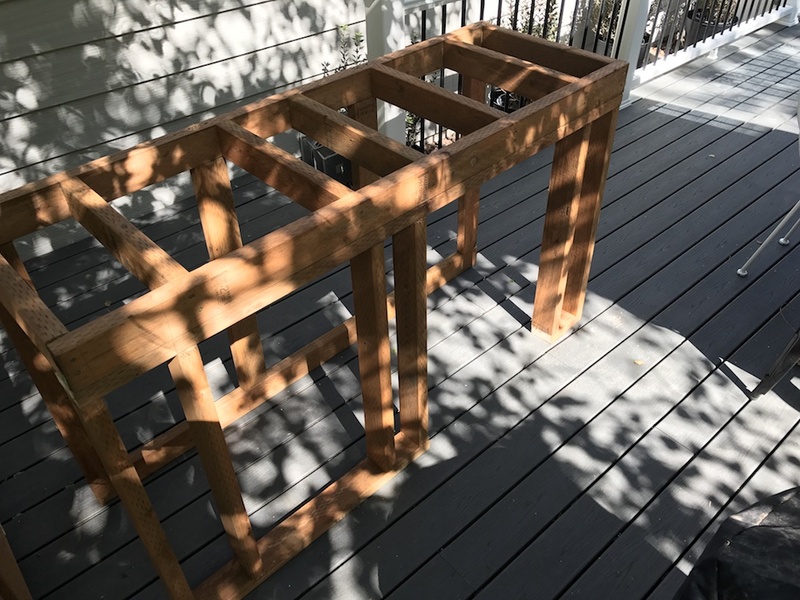 You can see in the above that we built each section of the frame independent from the others. Since they won’t all be the same (you can see the front one has a cutout for the cabinet/door) it helped to take one at a time. Then we connected them together. Before we secured the first section down, we attached concrete board to the back side, facing the house. Even though that won’t be seen, we wanted to make sure it was all enclosed and we wouldn’t be able to do that once it’s in place. In the center of our heat barrier we wanted to add a layer of fire retardant insulation. We added wire mesh between the supports around the entire grill area to keep the insulation in place. 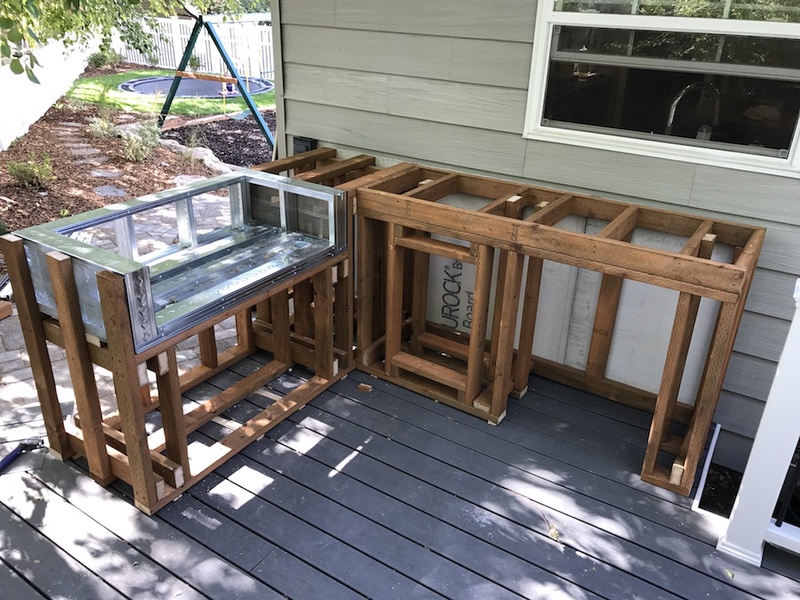 We used metal 2x4s directly around the grill area because they would help us achieve a solid heat barrier between the grill and the flammable building materials. Framing with metal is a bit of a bear, so wear gloves and invest in a good pair of tin snips. 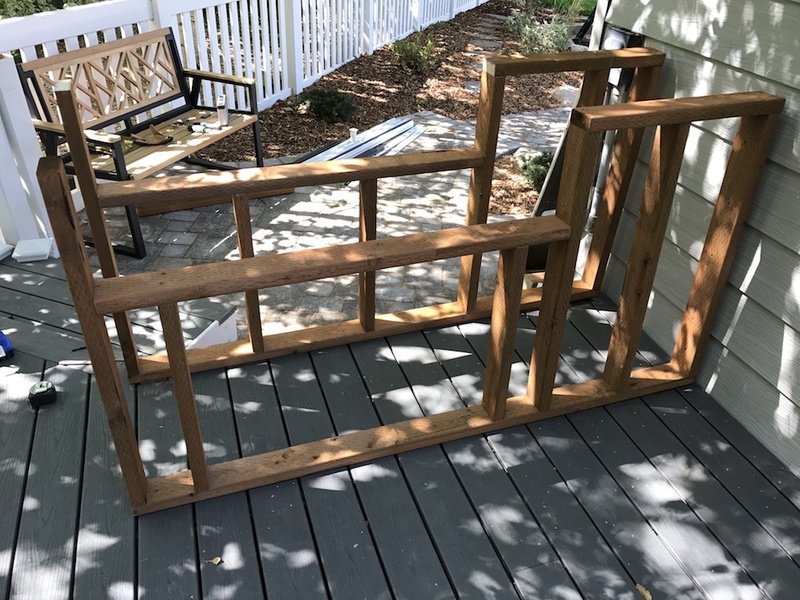 And follow standard framing guidelines – no more than 16in apart on center. For the two middle sections I added pressure treated 2×4 supports directly underneath them, spanning across, so help with stability and load. 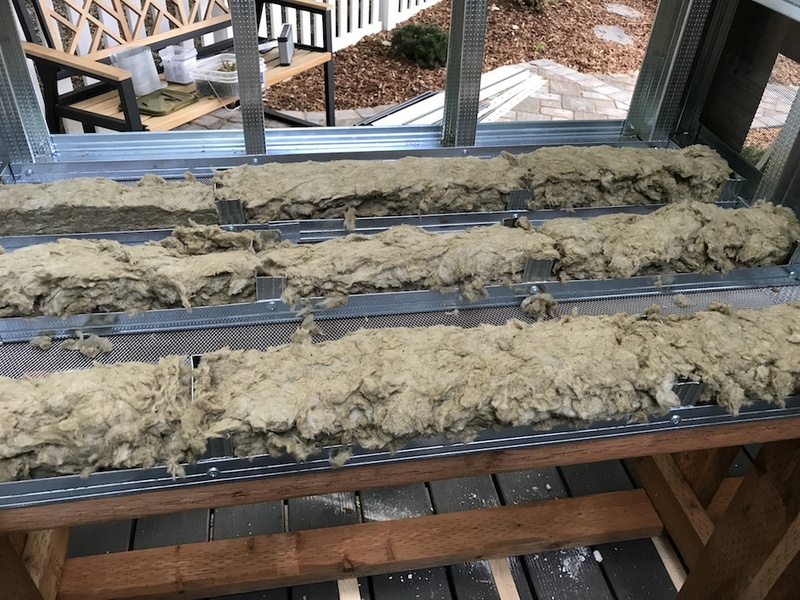 To ensure we had a solid heat barrier, we added insulation inside the metal studs. 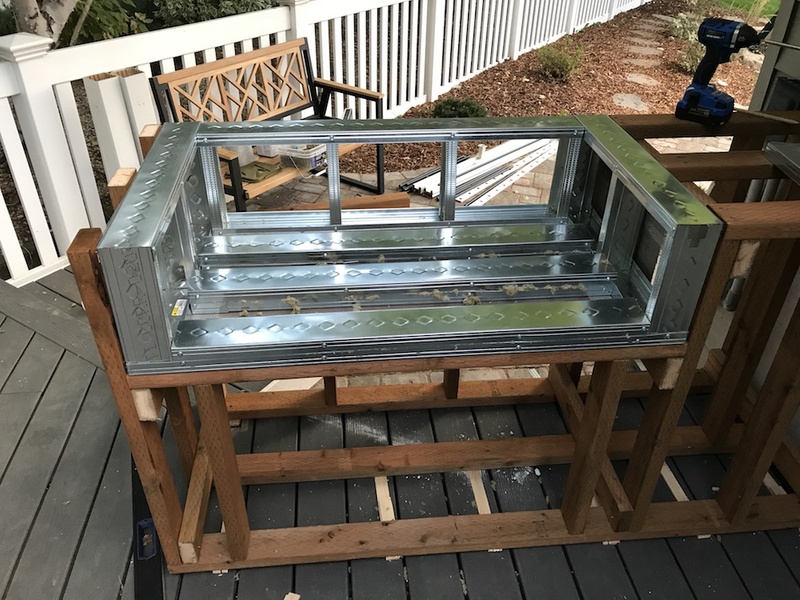 Once the top pieces were added and secured in place, the metal framing was complete. This section, like the first, was built in pieces and connected together. 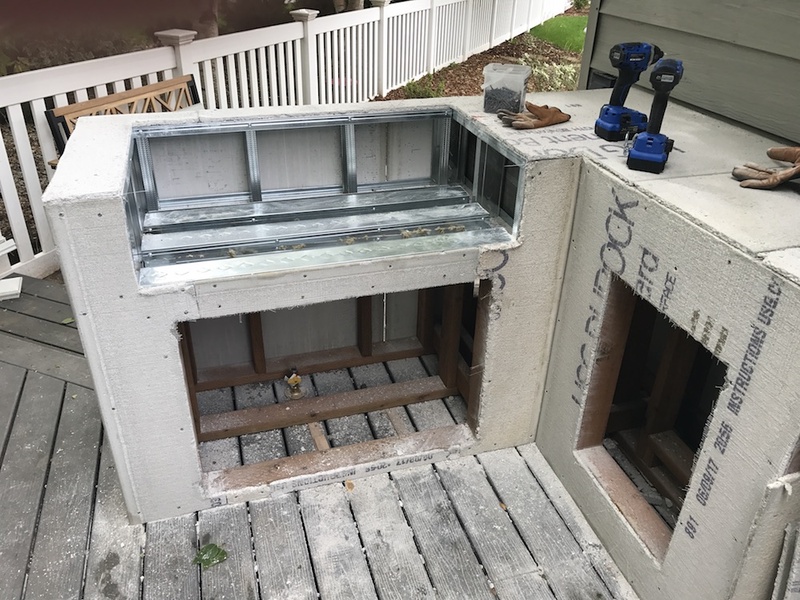 We also added concrete board to the back before putting it in place. You’ll notice that we used shims numbering not a few. That was part of the issue we had to sure up before building this, but it still left the deck a bit uneven. 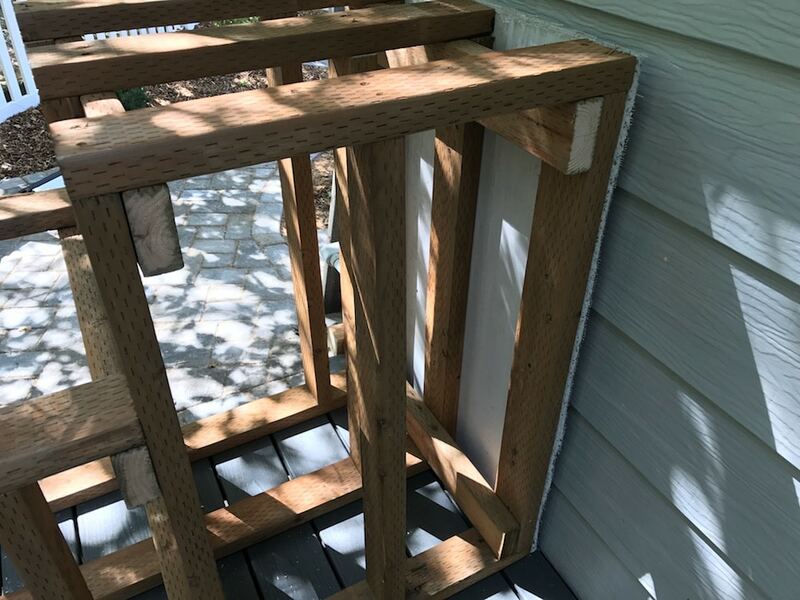 We used a level spanning between the two sections to square everything up, shimmed it and secured it to the deck with wood screws. 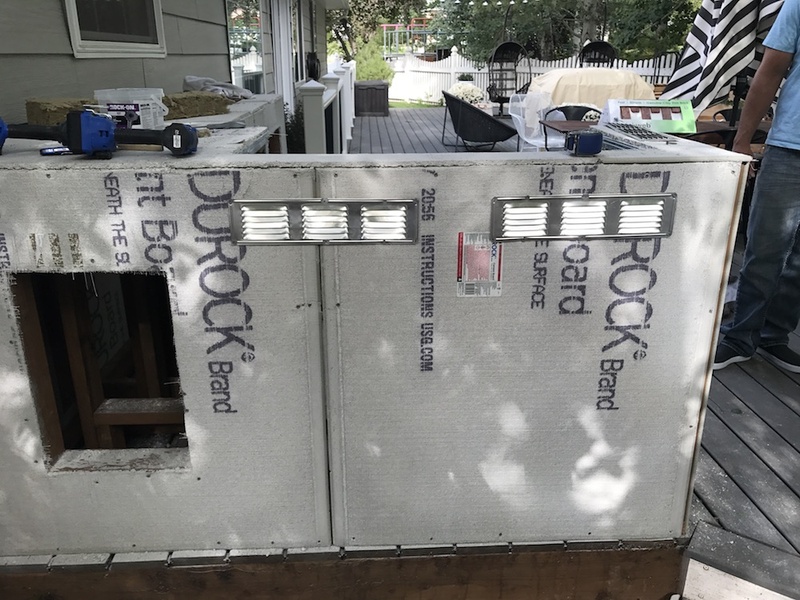 Durock is a great product for applications like this, because it’s fire resistant and holds up well in all kinds of weather. If you really wanted to get crazy with it you could cover the entire thing with a coat of Redgard, but we felt comfortable with the concrete board itself. We went to Lowe’s and picked up a couple vents that had a wire mesh layer on back (to help with bugs). The reason for this is, our grill has vents on the back side, below the visible area. These vents are both for output and intake. Fire needs to breath, so these vents allow the grill to take inhale and keep the fire burning hot, as well as exhale any dangerous fumes that could otherwise build up and combust. 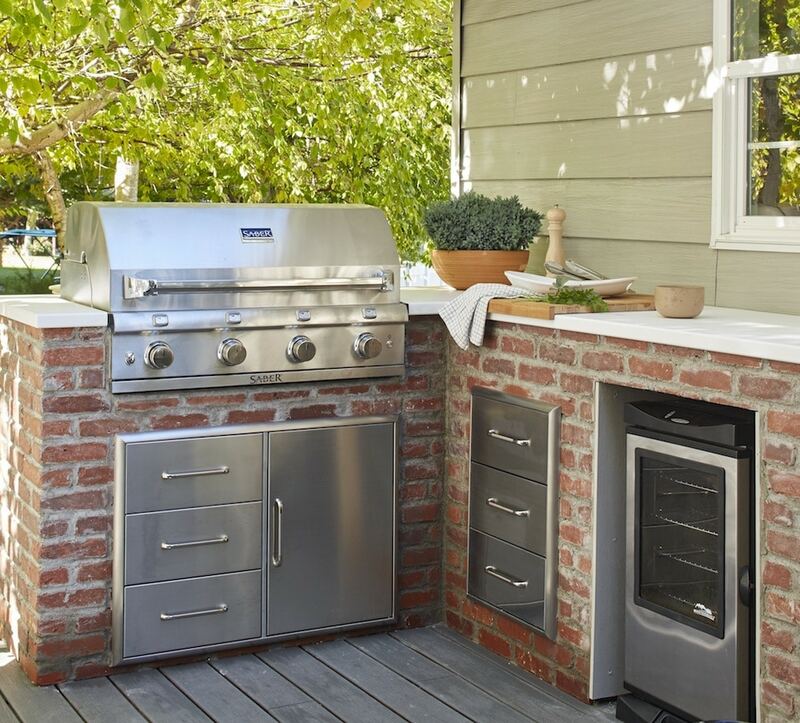 Proper ventilation is key to a safe outdoor cooking area. 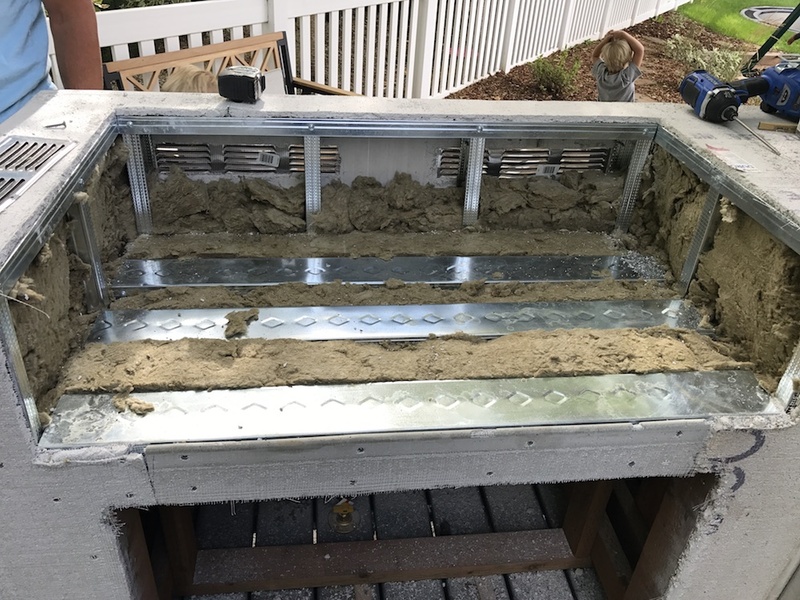 We put another layer of concrete board around the inside of the grill area, but before that we filled all the gaps with fire retardant insulation. Except, of course, the back area where we added our vents. That was kept open, for reasons explained in the previous paragraph. Though we had a natural gas line run for the grill, I still use a propane tank for my turkey fryer when I do shrimp boils or fry turkeys on Thanksgiving and stuff. The image above shows the space where we put the propane tank cabinet – on the back side. 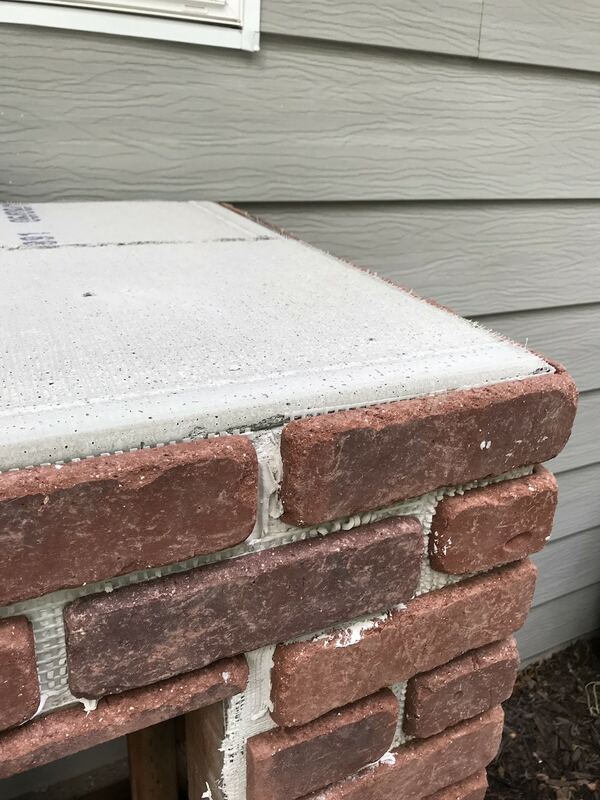 Once the mortar dried, instead of using grout like you would on tile, we used legit brick mortar in a similar fashion in between each brick. We put it into piping bags and piped it into the spaces, then ran along it with our gloved fingers. We were a bit stumped on countertops. 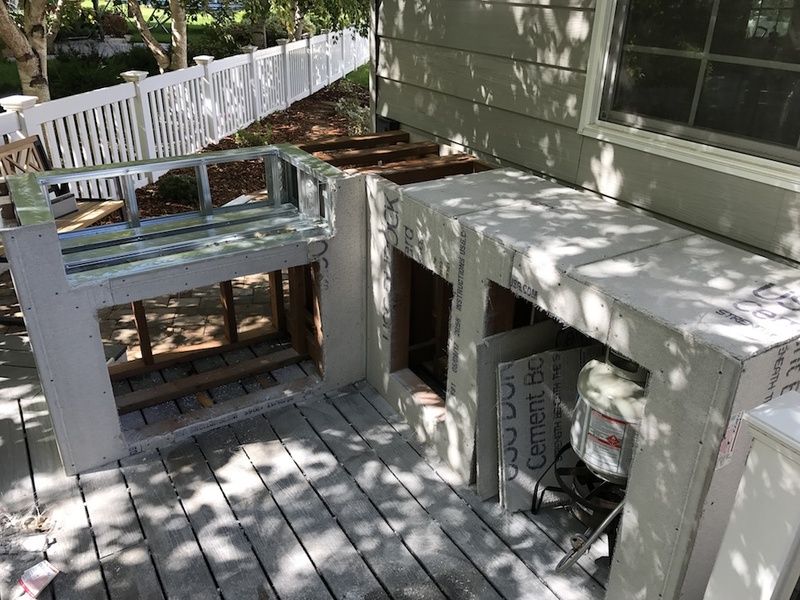 Even though we saved a lot of weight with the brick veneer, we didn’t want to add thick concrete countertops, but we also wanted something easy to clean and low maintenance. We visited a local metal fabricator who came out, took measurements, and created custom steel countertops that weighed less than 80lbs. 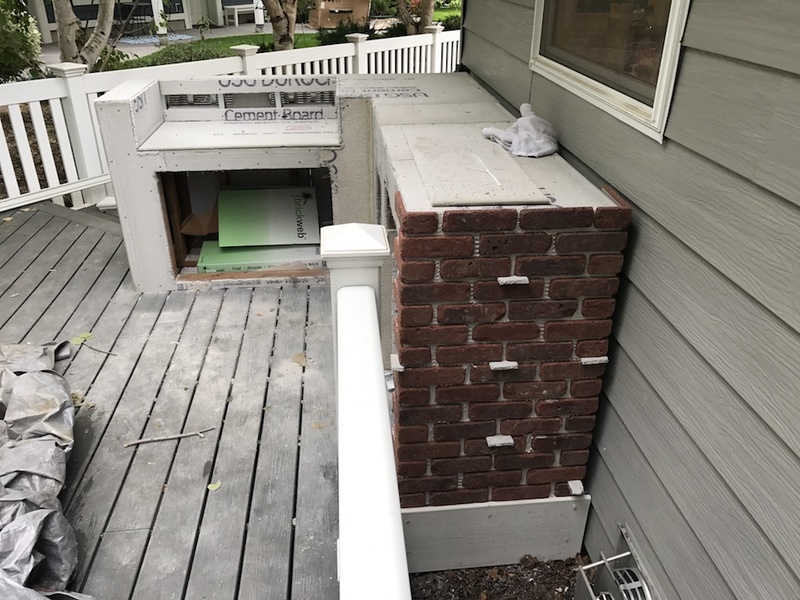 The white powder coat finish looks great with the brick and against the house, and is super easy to clean. Wipes right up. So now I’ve been using this Saber Grills grill in our outdoor semi-kitchen for almost a year (if you’re unfamiliar with Saber, they’re the high end line of Char-Broil – they use the same infrared technology I’ve praised in the Char-Broil grills I’ve had, with higher quality construction and even better performance). 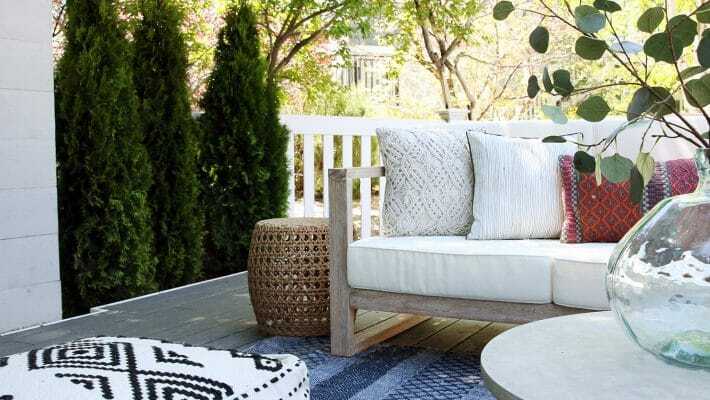 We absolutely love it and couldn’t be happier with how this whole area turned out, and how much it adds to our deck. The Good, The Bad and Would We Do It Again? The Prettiest Blue Paint for an Exterior + A Giveaway! Once again- you guys nailed it. It’s not too big or too small. Each detail perfectly thought out. 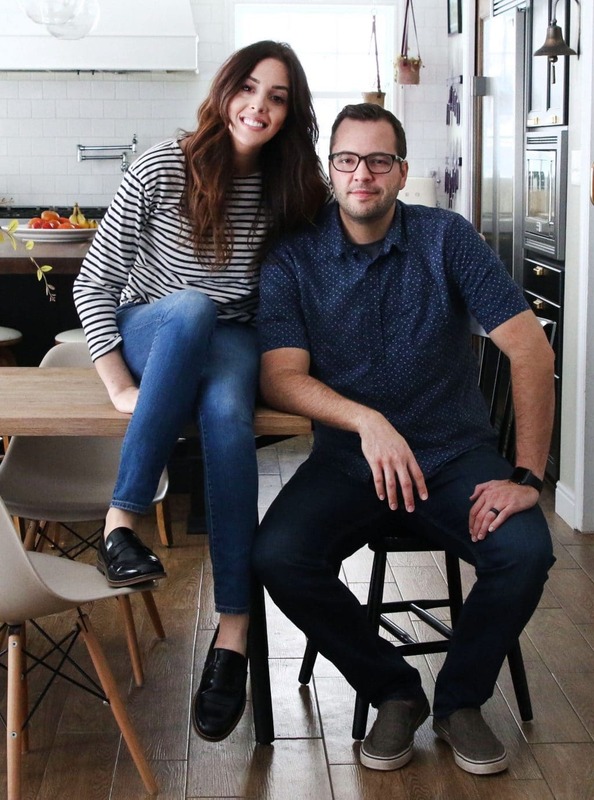 I really appreciate the way you put thought in to how you use a space, the people it’s for and the aesthetic that you both share. Your work is always set apart! Great job. 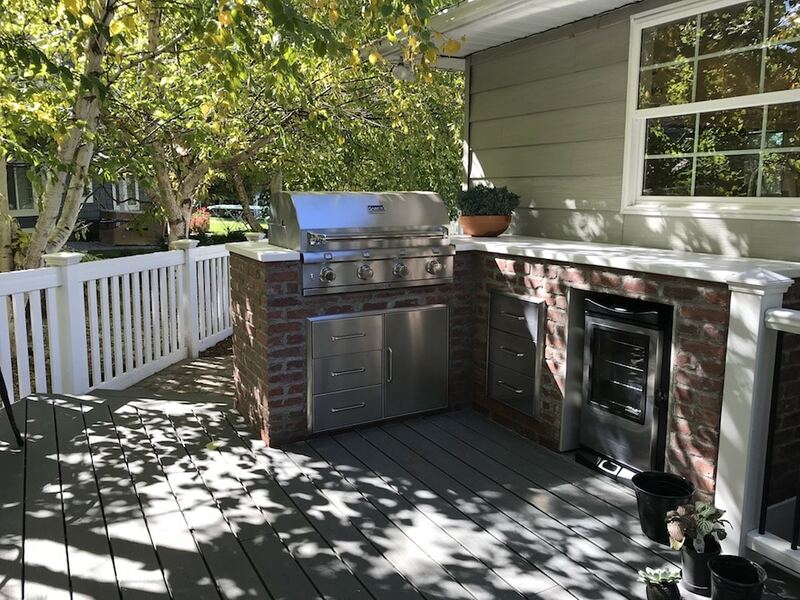 Is the grill weather resistant or is there a special cover for it or a way to maintain it looks good? Looks awesome!! It can definitely handle weather, but there’s also a cover for it to keep it from getting water spots or dirt on it. Do you pull your smoker out or use it in place? I have a masterbuilt with the exhaust on top and the wood chip on the right. I’m trying to decide whether to put it on a stand next to countertop or put under like yours. My setup will have an open back. I just pull it out whenever I use it. This looks fantastic. 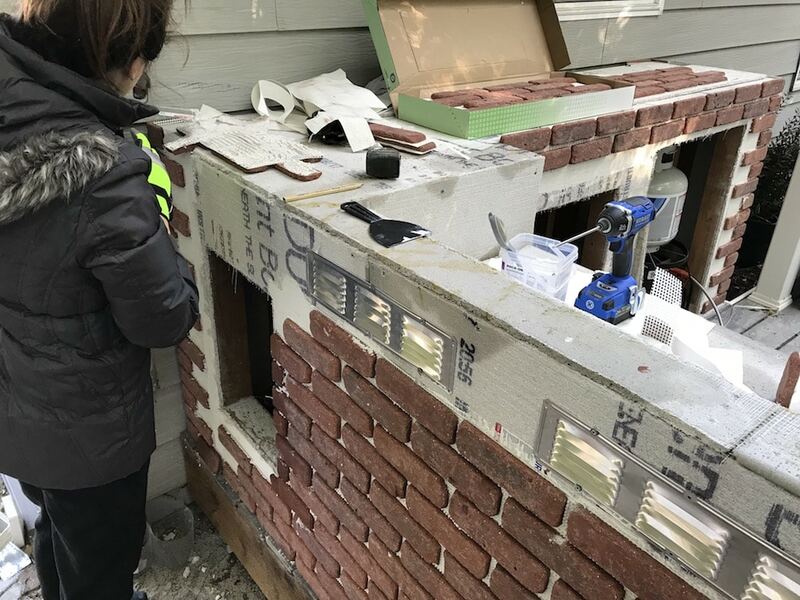 The brick veneer works really well and the counter top was a great idea. 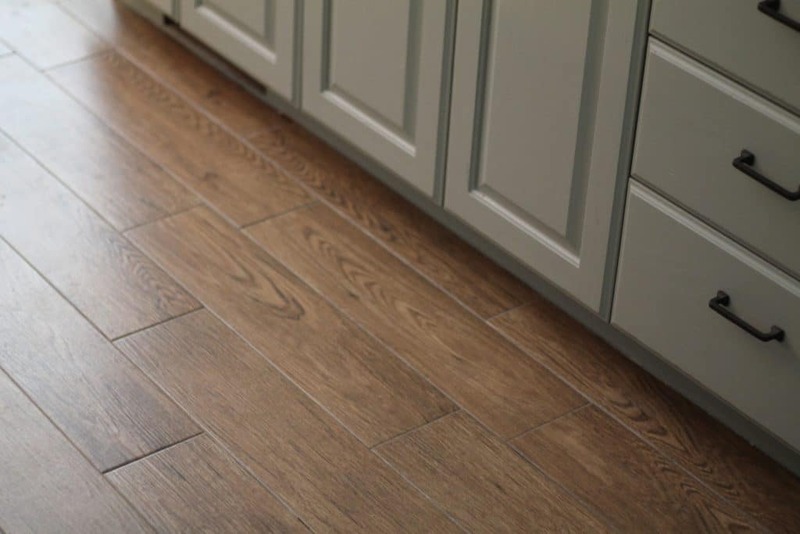 Would love to see a follow-up post seeing the kitchen in action for a family dinner or party! We have soooo much to do still inside our house but I’m most excited about someday revamping the patio with an outdoor kitchen. I never would have even thought about all of the fire resistant components! That’s what my husband and dad are for ha! We built our bbq area out of cinderblocks and concrete, so no need for anything fire resistant. But we weren’t on a deck, so I’m sure it would have been way too heavy for you guys. This looks so great!! Love the brick! Awesome! What do you keep in the drawers and do you find that you use them? I use them for my grill and smoker covers when I take them off, my grill scraper, some paper towels and a few deck games. I really love how this came out and am really so impressed at all the thought over each detail like the propane cabinet on the back side and all the weight considerations that added to your decision making. 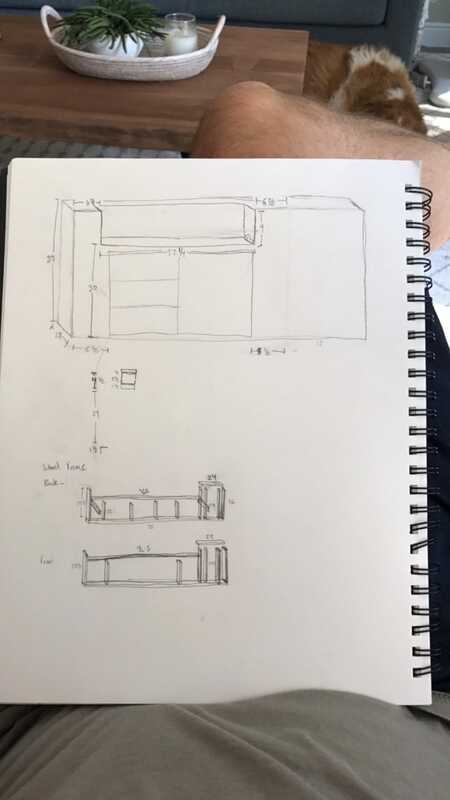 What are all the drawers and cabinets used for? Do you have an outlet nearby to set up, I don’t know, crocks of warm cider during your fall party? Such a nice compliment to your home and outdoor living space. We do have an outlet and that’s an excellent idea for our Halloween party. So smart! I use the drawers to hold my grill and smoker covers when I take them off, and the door under the grill holds my turkey fryer burner. Looks nice! It looks like it’s just the perfect size, too. I’ve seen some way-too-big outdoor kitchens that just look weird. I use the drawers for my grill cover and grill scraper and a few deck items, and the door under the grill is where the natural gas line comes up, and where I store the burner for my turkey fryer.